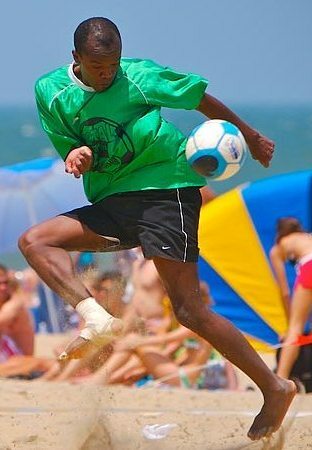 SANTA MONICA BEACH SOCCER IS HERE! ENJOY THE BEACH, THE SAND, THE SUMMER, AND SOCCER IN SANTA MONICA! DON'T WAIT - REGISTER ASAP! REGISTER NOW FOR EITHER OR BOTH OF TWO SESSIONS! Team Registration Fees are listed on the team registration form. NOW ACCEPTING APPLICATIONS FOR MEN, WOMEN, COED TEAMS 5 V 5. ALSO WE ARE OFFERING YOUTH LEAGUES FOR 16-19 YEAR OLD YOUTH IN BOYS, GIRLS AND COED. Beach Soccer will be played in the sand, right next to the beautiful Annenberg Community Beach House, located at 415 Pacific Cost High, Santa Monica, CA 90402. BEACH PARKING: 90 MINUTES FREE! Two Beach Parking Lots available: One at the Annenberg Center, the other walking distance away. FREE, up to 30 minutes prior to kickoff and up to 30 minutes after the game.